This looks really excellent. As we ponder some of the changes that are coming down with a revised set of grad standards, curriculum and assessment frameworks and re-written curriculum K-12 we will be in the position (hopefully) of some re-tooling of our workforce and our system. There is no doubt we will have to have serious conversations about how we move forward as a system, as opposed to focusing on individual teachers. 2) What skills and competencies do our teachers and other educators need in order to intentionally build those skills in our students. 4) What type of professional development do we need to ‘bump up” our skillsets. Thanks Andy – I think you have added some great challenges. I have been thinking a lot about #3, in looking at my current skills, and the skills of those around me. We need to build the leadership capacity of the capacity builders in our system moving forward. I believe that many of those characteristics we see in numerous adults today, but there is no real change in the way business is run, meetings are done or training is lead! Even classes that are prepared for those that are in the midst of change are still held in manner that is not becoming our forward thinking model of capacities. Change never is immediate and when it is it leads to major meltdowns and numerous problems. In order for our system to shift it needs to happen slowly, with the proper supports in place because one has to make it apart of the way one thinks and does. Teachers need to have the space, support and ability to change and this will never happen without a gentle, guiding hand! True – it is great that if we are looking for a new set of skills, but unless we have a changed system, these skills will not be utilized. Chris, in my opinion the slide does an excellent job of presenting a systems approach to understanding the challenge of change. I believe it is equally valid as a starting pointing for thinking about change in all sectors – not-for-profit; public and for-profit. The slide reinforces the concept that real solutions requires hard work by well-meaning, collaborative and supportive stakeholders. Thanks Martin. I think it is an interesting framework to use as we look in our organization at the skills, attributes etc. we look for in potential principals and vice-principals. It is interesting, I saw this as a great list for educators, but a number of people who have read it have commented how applicable it is to other areas. I am happy to provide a one-page handout to any of you that you can use based on the framework – if you email me at ckennedy at sd45.bc.ca I can send it to you. thanks, Chris. I really appreciate the “red and green” idea. Great post Chris- I, too, like the red and green idea as I consider a “mindful” appraisal of my own leadership-I’d appreciate a copy of the chart! Thanks Val – I will share the chart out with all in our admin group. 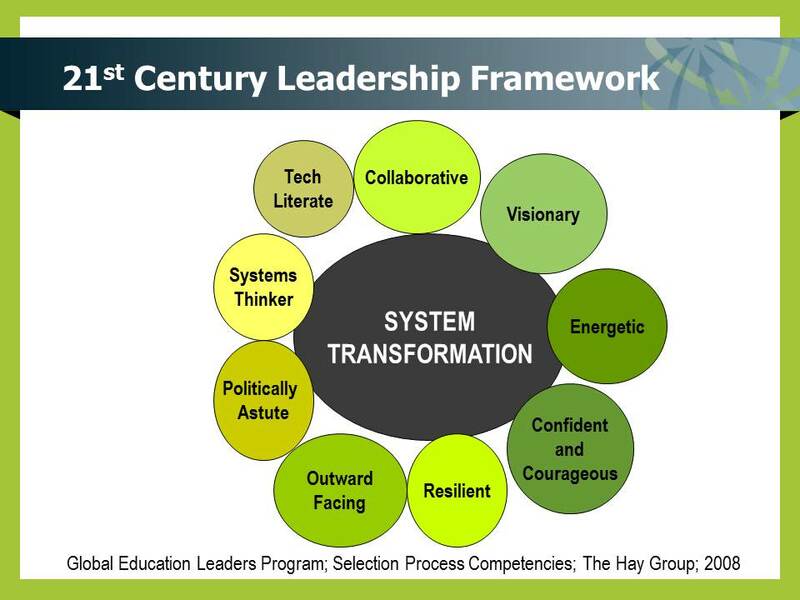 on January 5, 2013 at 4:14 PM | Reply Leadership for System Transformation | Educador: "Out of the Box"